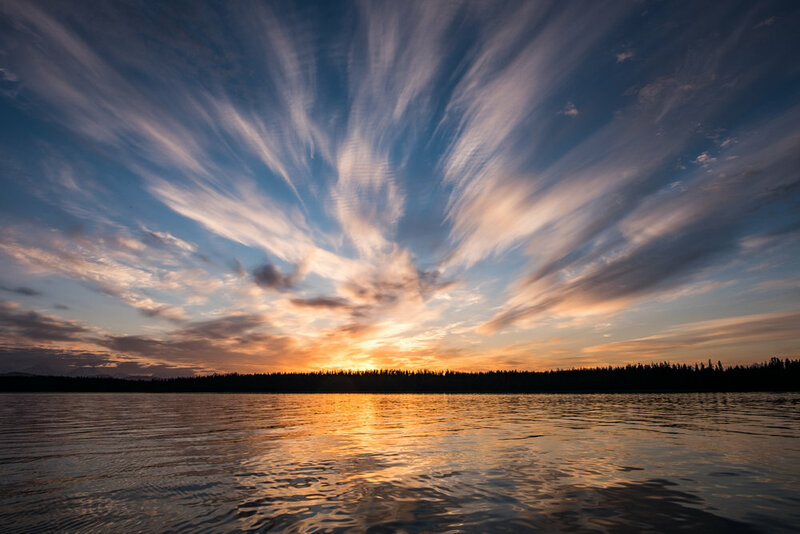 To the lover of pure wildness Alaska is one of the most wonderful countries in the world ... it seems as if surely we must at length reach the very paradise of the poets, the abode of the blessed. Glacier Bay is a homeland, a living laboratory, a national park, a designated wilderness, a biosphere reserve, and a world heritage site. It's a marine park, where great adventure awaits by boating into inlets, coves and hideaway harbors. It's also a land park, with its snow-capped mountains, spectacular glaciers, and emerald–green forests. From the summit to sea, Glacier Bay's wildness is remote, dynamic and intact. 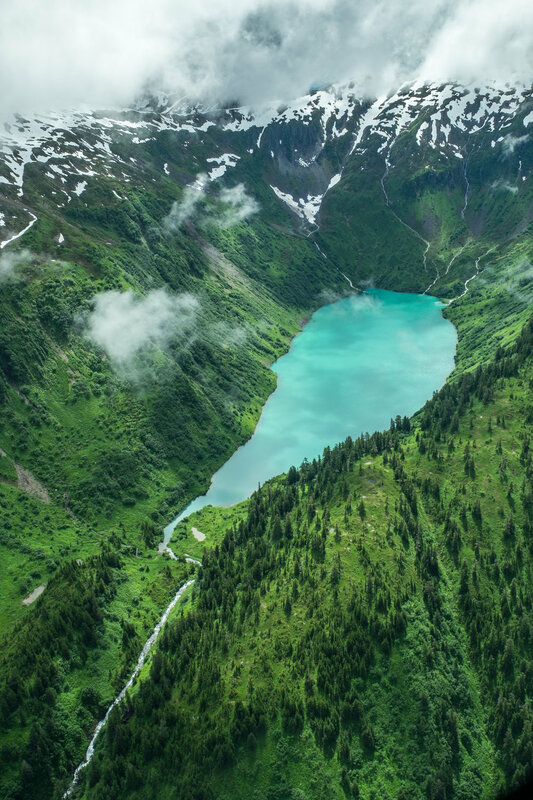 While Glacier Bay National Park has plenty of beautiful mountains, rainforest, and cultural history to explore, the heart of the park is in the water—where glaciers spill out from adjacent mountains to create the icy seas. 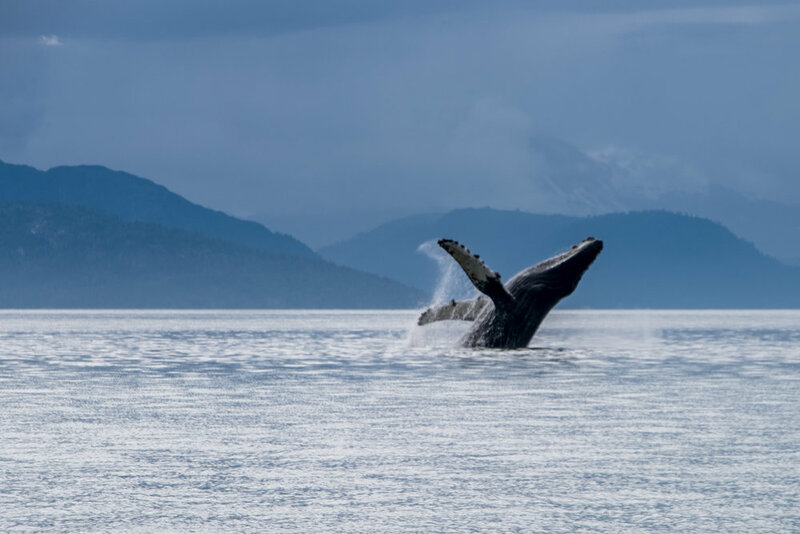 From the vantage point of the water, you can immerse yourself in the marine habitat that is home to humpback whales and a variety of other marine wildlife. Visible on the shore, wolf, brown and black bears feed on tidal delicacies. Beneath the sea, halibut and salmon thrive, making this one of the best places on Earth to drop a line. It is for all of these reasons and more that in the water is exactly where we stayed during our time in Glacier Bay. Our methodology is not unusual—90% of visitors arriving at the crown-jewel of cold-weather cruise destinations never get off the boat. We arrived to the Frontier State with our Airstream in tow via the the famed Alaska Highway, so we had to think a little more creatively to find our way onto the waters in Glacier Bay. It wasn't difficult, there are plenty of outfits in the area that know the waters better than any, and go hard each summer season to share the beauty with visitors. In that spirit, we are outlining four different ways to enjoy water-based adventures in one of the few U.S. National Parks that is made up almost entirely of water. We’ve also teed up some advice on where to establish your land-based operations. 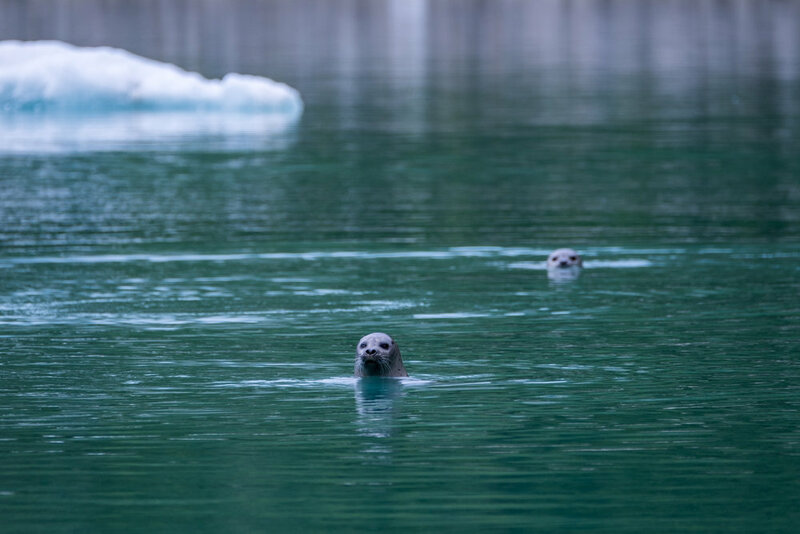 Just one of the incredible wildlife sightings to be had in Bartlett Cove aboard the National Park Service Tour Boat: Harbor seals happy at home in Glacier Bay. Each time we hit a new park, we head first to the park visitor center to talk to the rangers about what there is to do. The Glacier Bay Tour Boat operated by the National Park Service is typically the first outing for most visiting Alaska’s water wilderness. Each day, the boat embarks at the dock adjacent to the Glacier Bay Lodge and sets off on a 130-mile trek through Bartlett Cove and Glacier Bay. Lunch is served at the mid-way point, sandwiched by a day-long traverse of the bay offering views of its wildlife, birdlife, and the tidewater glaciers that gave the park its name. Along the way, park rangers lend insight to everything you are seeing and then some. This is a perfect introduction and overview to life in Glacier Bay. Taz Wildlife Watching is one of the most popular outfits in Glacier Bay, with a 75% success rate in spotting Humpback Whales in their feeding ground. Their experienced captain took us into the heart of their habitats continuously through our all day outing. Seen here, a pod surfacing right next to the boat. Taz Whale Watching is the most popular game in town when it comes to whale watching, a result of their stellar record of producing sightings—75% of all outings see whale activity. 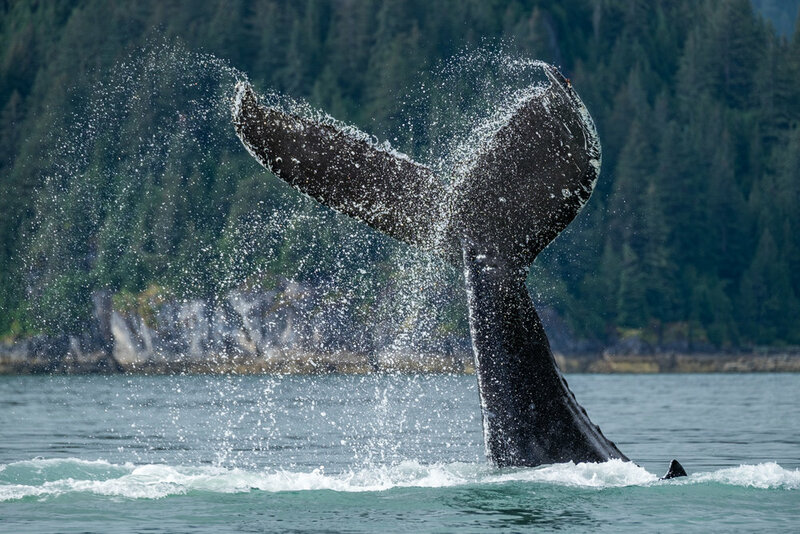 Minky, Humpback, even Orca live in the Glacier Bay feeding grounds during the summer season, showing at the surface to spout air, and if you are lucky, bound from the water in what is called a “breach”—a complete lift from the water. A breach is the marine wildlife equivalent to watching a bear paw a salmon from the river or a lion take down a wildebeest in Africa. 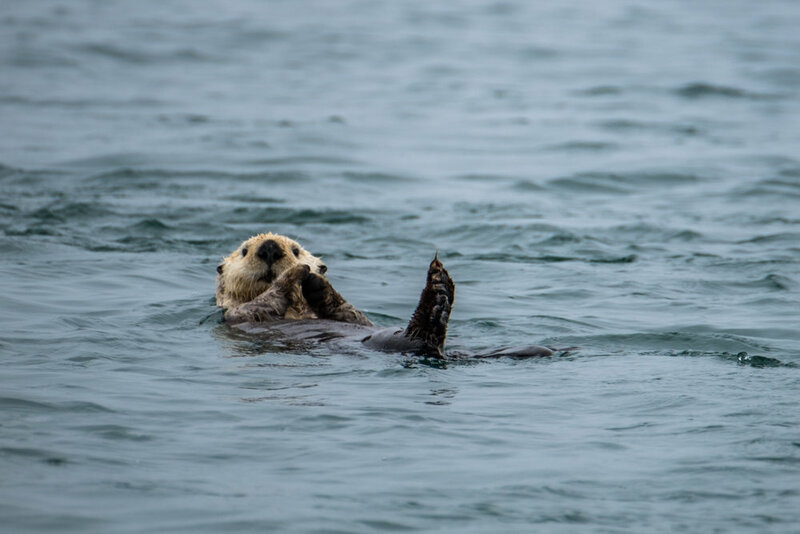 It’s more of a wildlife watching expedition than merely a whale watching one, you will likely also see harbor porpoises, stellar sea lions, harbor seals, sea otters, bald eagles, and again if you're lucky, orca ("killer") whales. Taz operates trips seven days a week from May to September. Stef paddles out into Bartlett Cove from the Glacier Bay Lodge. 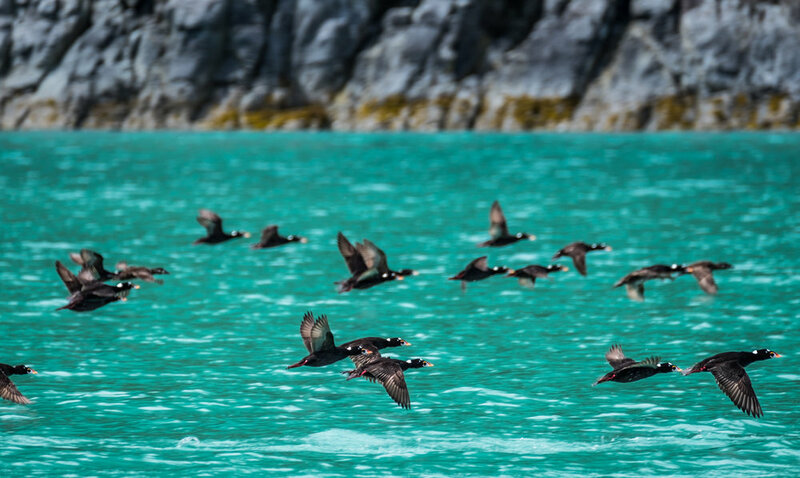 The Glacier Bay Lodge is also the jumping off point for sea kayaking excursions (guided or solo) where you can paddle the shorelines in Bartlett Cove and take in views of Alaska wildlife. From the water, you can safely view shore-side bear activity from a distance. 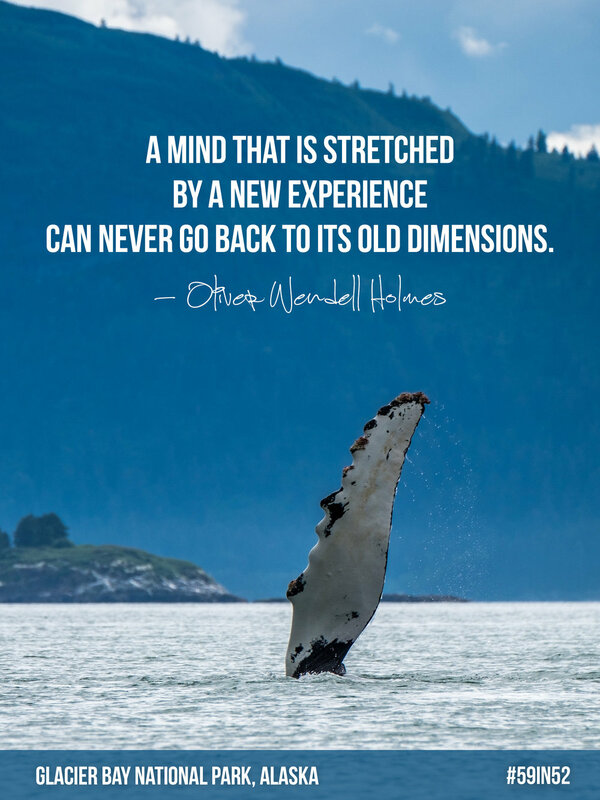 Humpback whales are active in the area during each summer season, which is incidentally the most popular time to visit, and can be seen on the icy blue horizon. If you are lucky, you will see them breaching in the distance and even in your immediate vicinity. It's pretty awesome when the kayak outfit braces you with instructions on what to do if a multi-ton sea mammal coasts beneath your tiny watercraft. Sea otters also common the area but you probably won’t get too close, they are protective of their young, and as such, not too keen on being near humans. All the same, this is a wildlife habitat and we aren’t meant to get too close anyway! 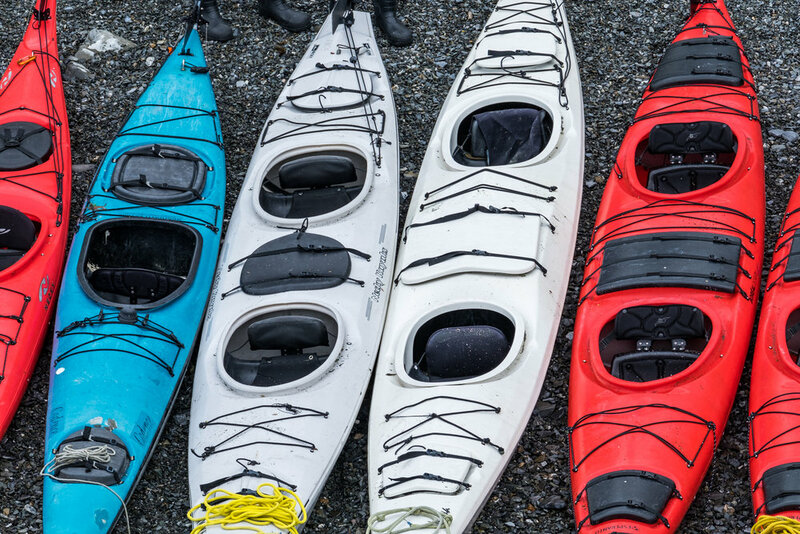 Glacier Bay Sea Kayaks organizes backcountry kayak/camping trips up to ten days long and will outfit the entire experience for you. We went out for only a day, and that too, was totally awesome. Captain Jim Kearns is one of the most experienced and knowledgable skippers in Glacier Bay, having navigated the waters for decades. Here, he shows us how to wrangle a 70-lb halibut, one of many we pulled up that day, and enjoyed for dinner at his bed & breakfast in Gustavus. Fairweather Adventures Glacier Bay took us out for a day of cold-water fishing and it turned out to be one of our favorite memories of our time at this water-based park . You don’t need to be an expert fisherman, or even good at fishing to find success—we both pulled up 70-pound halibut! 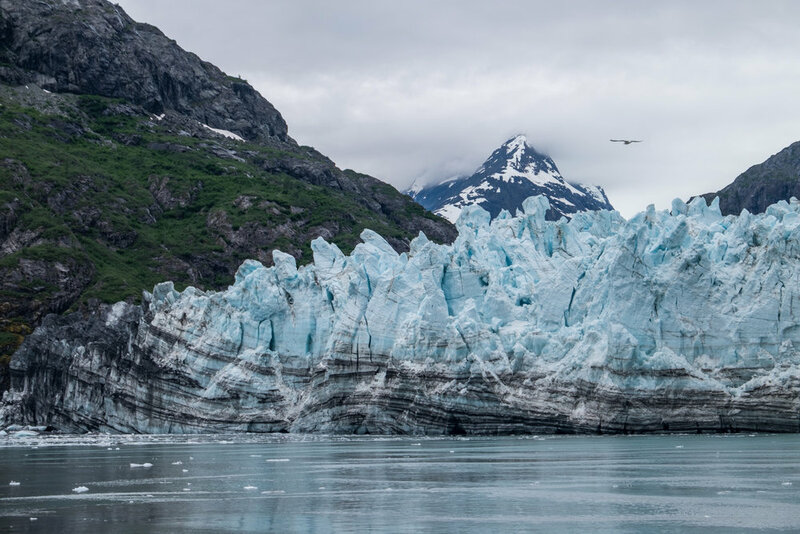 What was so cool about this experience was what we learned from our boat captain, Jim Kearns, a local guide who has lived in Glacier Bay for 30 years and is regarded as one of the best in the area. He and his wife Julene run a bed and breakfast in the nearby town of Gustavus, where they invited us into their home to eat “the bounty of the sea,” as they called it—our halibut, rockfish, and salmon catch from the day. Conveniently located on the second floor of the Glacier Bay Lodge is the National Park Service Visitor Center. Nightly educational programs are offered, and passionate park service employees are on hand to answer questions to help you better plan your adventures. The Glacier Bay Lodge is located in the only established area in the park in Bartlett Cove, where nearby you can set out on easily accessible hiking trails, explore native historical exhibits, push off for day-long paddling excursions, sign up for and set out on the Glacier Bay Park Tour Boat, and easily pick up park information in the park visitor center that is conveniently located on the second floor. The restaurant deck offers sweeping views of the bay, positioned west making it a perfect place to enjoy dinner and take in the sunset after a day of exploring! Glacial ice calving (breaking and falling) from Margerie Glacier. How to get there: There is only one road to Glacier Bay National Park, and it is only 10 miles long reaching in from the small town of Gustavus. To get to Gustavus, you will need to hop on a flight (commercial in the summer, operated by Alaska Airlines; and/or by bush flight, year round); or on a cruise or tour boat. 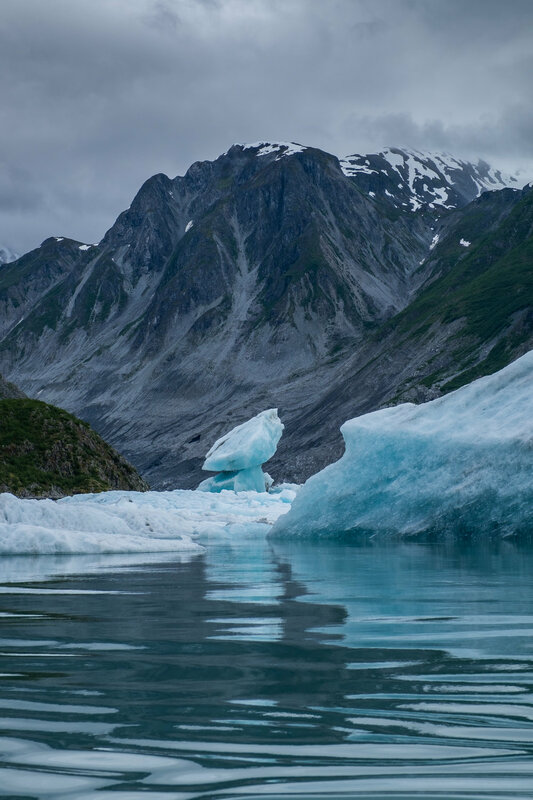 How the park got its name: Legend goes that the name "Glacier Bay" was coined in 1890 by Captain Lester A. Beardslee of the U.S. Navy after pulling aside the ice-mouth that is Glacier Bay in the Icy Straight. Iconic site in the park: To watch glacial ice calve off the enormous Margerie Glacier is to submit to the soul of this park—glaciers. 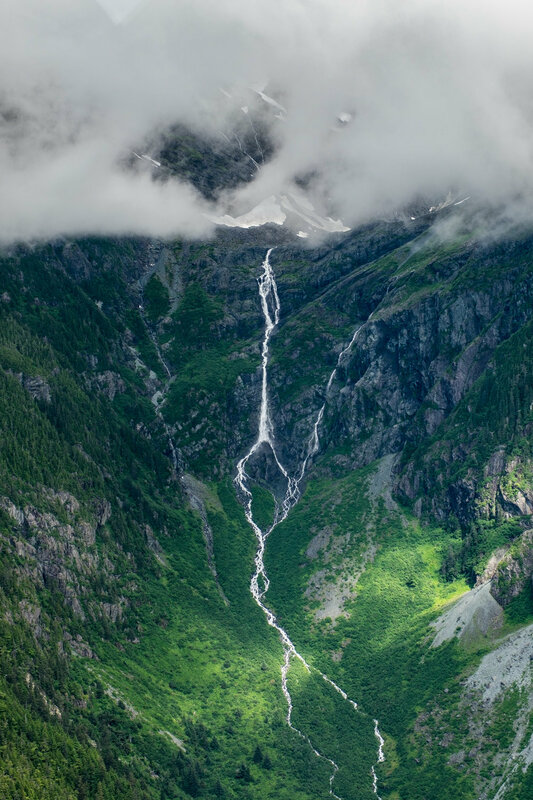 Marjorie is 350 feet tall (100' below water, 200’ above), 1-mile wide and 21 miles long (or deep) extending from Mount Root on the Alaska-Canada border. The glacier was named after French Geologist Emanuelle de Margerie, who explored the area in 1913. To modern-day explorers, it is beloved as one of the most actively calving glaciers in the park. 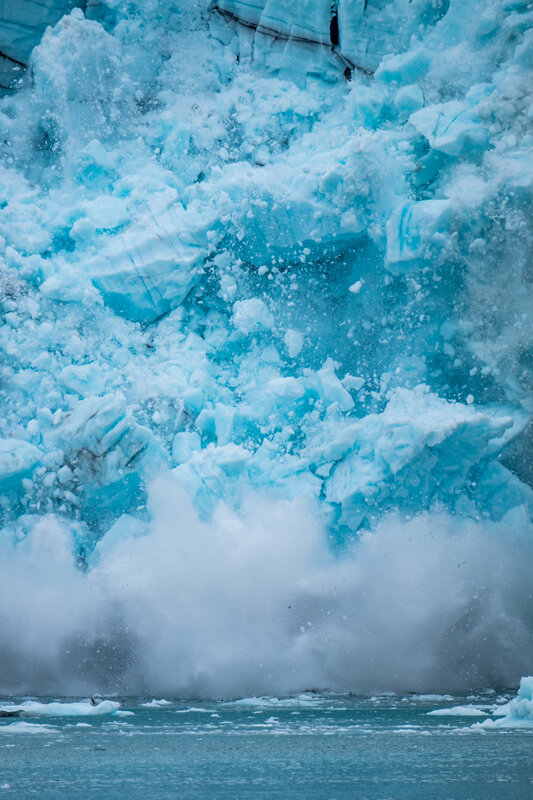 "Calving" refers to the activity of glacier ice departing from its landmass and crashing down into the waters while sounding loud, seconds-delayed "booms." By boat, you can get right up next to it and watch it in action. National Geographic Expeditions offers an experience where you can wake up there and sip coffee aside of it. Amazing! The National Geographic Sea Lion docked in Bartlett Cove in the heart of Glacier Bay. 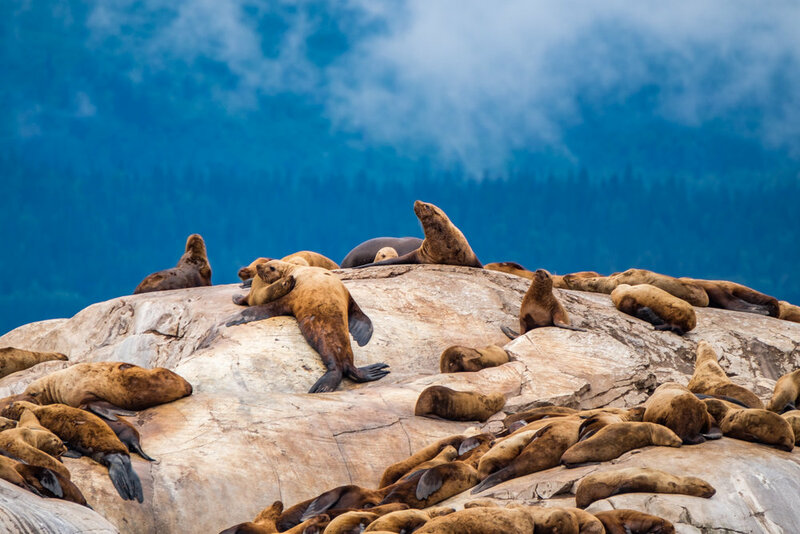 NatGeo provides an 8-day cruise from Seattle through the Inside Passage and into Glacier Bay (and elsewhere) bringing you into the fold of Glacier Bay's wildlife and dynamic glaciers. 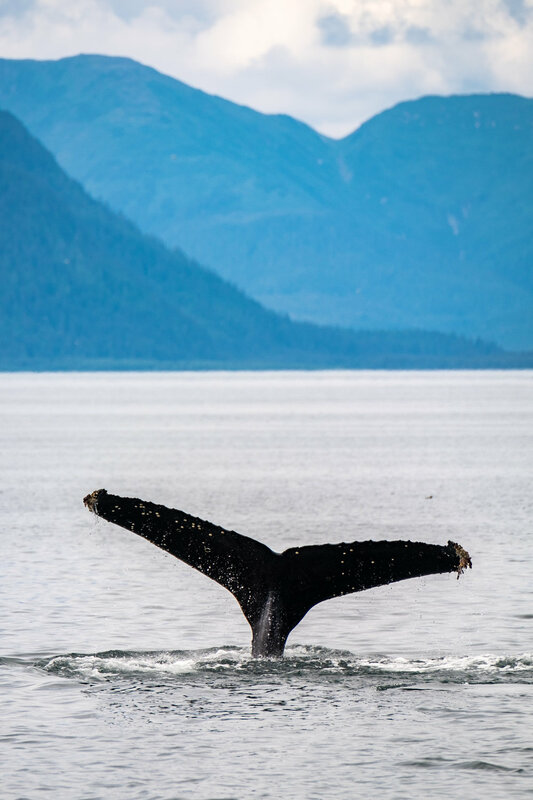 Accessible adventure: Glacier Bay is the most notable name of any place in the Inside Passage, and the heart of the park is in Glacier Bay where humpback whales, scores of bird species’, and other sealife frolics; while bears, wolves, and moose can be seen dotting the shores behind them. 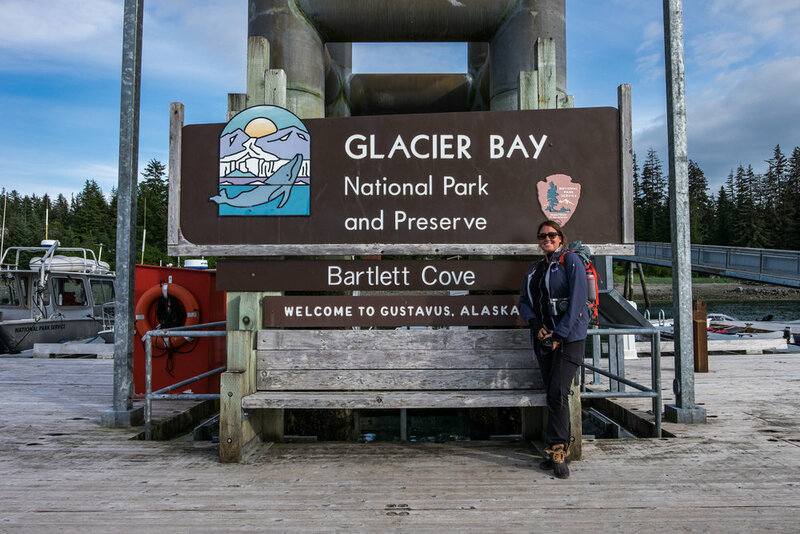 The easiest way to get out there is to hop on the National Park Service Tour Boat, which departs daily from The Glacier Bay Lodge in Bartlett Cove. 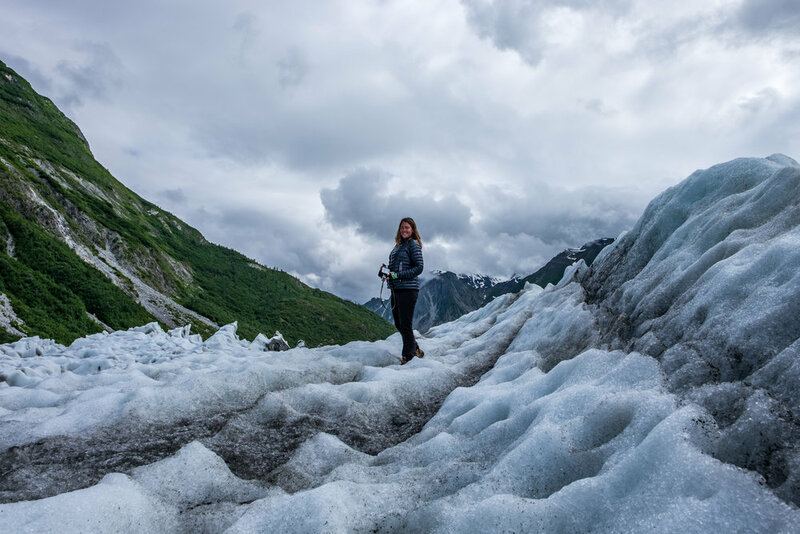 Full day excursions are narrated by knowledgeable and inspired park rangers, who lend insight into the glaciers that gave the park its name, the outlying wilderness, and the local wildlife who live there. Big adventure: Backcountry camping in the mossy forests that surround Glacier Bay is not for the faint of heart—one must be comfortable bushwacking their way through a trail-free wilderness, wearing all of the gear they'll need for the duration of their trip, not showering, using the facili-trees for days on end, and be comfortable sleeping in bear country. Once all of that is addressed, to be out there without the audio/visual impact of other human beings is divine. 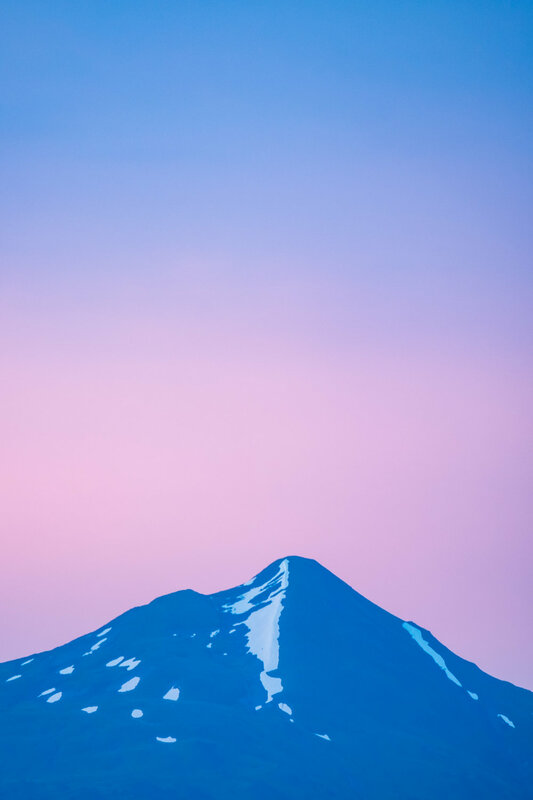 In the quiet of the Alaskan wilderness you can watch moose, brown and black bear, wolves, and mountain goats in their natural habitat; while in the summer season (the most popular time to visit,) calving glaciers and humpback whales sound-off in the distance. Glacier Bay is the largest UNESCO Biosphere Reserve in the world. In 1925, President Calvin Coolidge established it as a National Monument. In 1939, it doubled in size through a Presidential Proclamation signed by President Franklin D. Roosevelt. Glacial ice is dynamic, artful, and incredibly photogenic as can be seen in this photo taken on our outing with Fairweather Adventures out of Gustavus. 250 years ago a single, large tidewater glacier covered all of Glacier Bay; today, glaciers cover only 27% of the park. 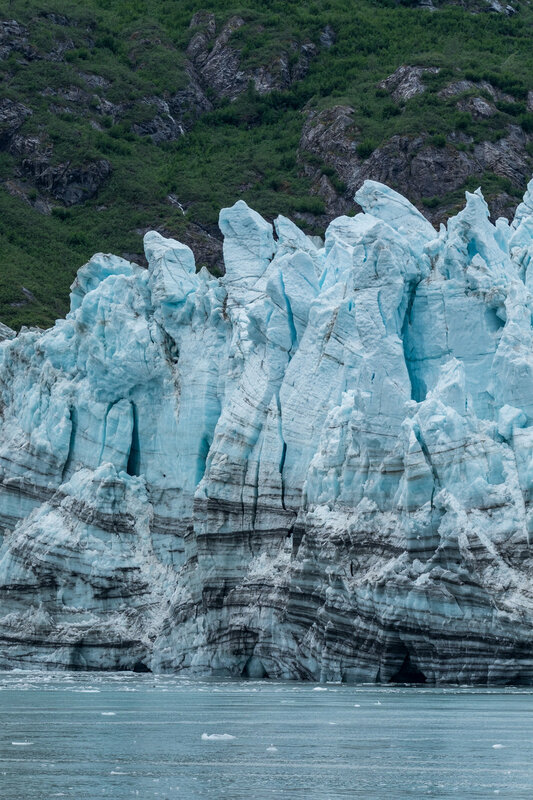 According to the National Park Service, there were 1,045 glaciers at last count—50 named glaciers, 7 of which are active tidewater glaciers that calve icebergs into the sea. Glaciers are recorded to have started retreating during the 19th century. 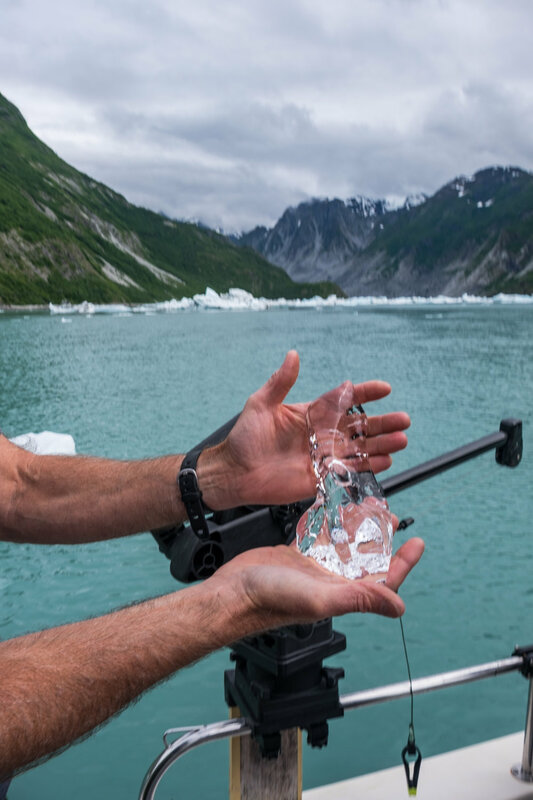 In short, Glacier Bay’s glaciers are quickly disappearing. Only two glaciers in the park are advancing. In 1879, John Muir recorded his “discovery” of Glacier Bay. He entered the bay in a dugout canoe and was guided by Tlingit Indians, native to the region. The first white man to actually lay eyes on the area that would later become known as Glacier Bay was Lt. Charles E.S. Wood, who explored the bay and climbed the mountains northeast of Mt. Fairweather in 1877. 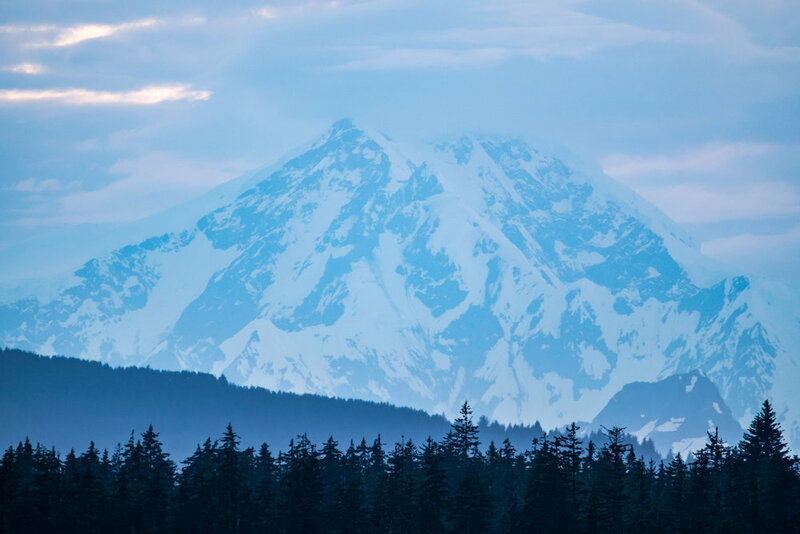 The Pacific Mountain System is comprised of the Chugach and Kenai Mountains, and of the Alaska, Aleutian, and St. Elias mountain ranges. All of Alaska’s national parks (there are eight) are located among these ranges except for two of the least visited in the entire system: Gates of the Arctic and Kobuk Valley National Parks, which are located in the Brooks Range. Geologically speaking, all of Alaska is quite young and very active. It is located on the Pacific Ocean's volcanic Ring of Fire. Lonely Planet’s National Park Edition writes that Alaska claims the most earthquakes of any place in the United States: 52%, with 13 occurring each day. 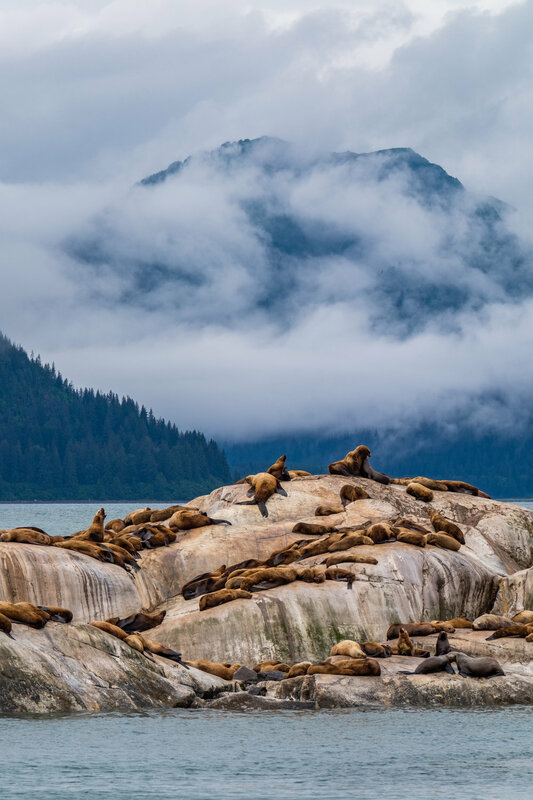 While cruising Glacier Bay is the most popular means of travel, the National Park Service limits the amount of sea vessels allowed in the bay on any given day. 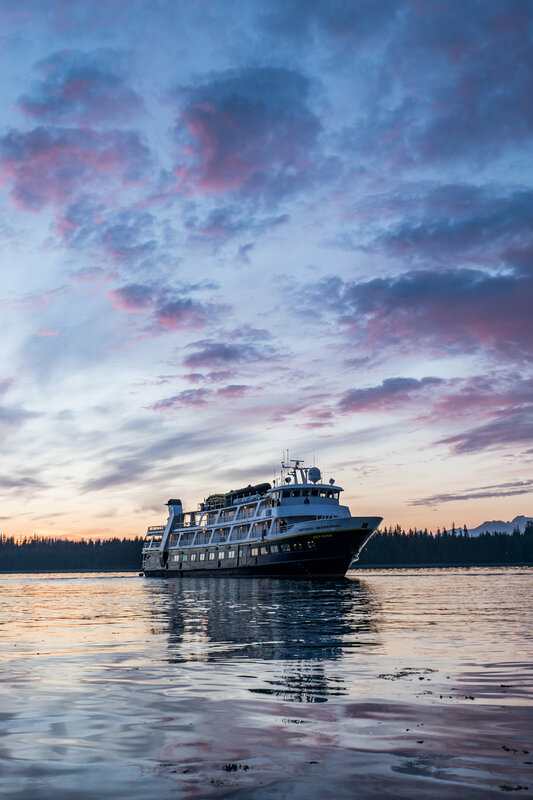 Cruise ships carry more than 1/3 of all travelers to Alaska annually. 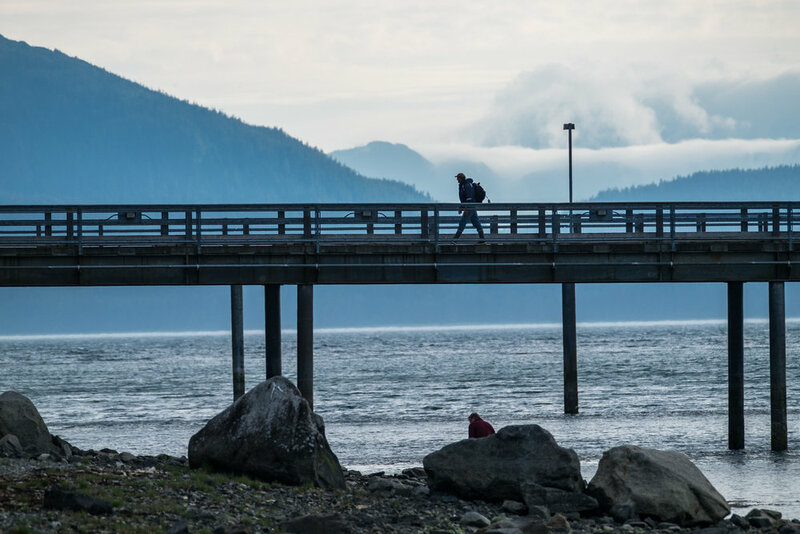 There are a small number of places to stay while exploring Glacier Bay – the Glacier Bay Lodge, Bartlett Cove Campground, and smaller accommodations located nearby in the town of Gustavus. The park-adjacent town of Gustavus has had electricity only since the 1980s. We were told by one of our guides that during that time, all of the families who lived in the community would be on call to clear their order from shipping barges that could arrive at any time of day or night. Today, the locals of Gustavus (like so many in Alaska) make multi-day runs to Costco in Anchorage to stock up. 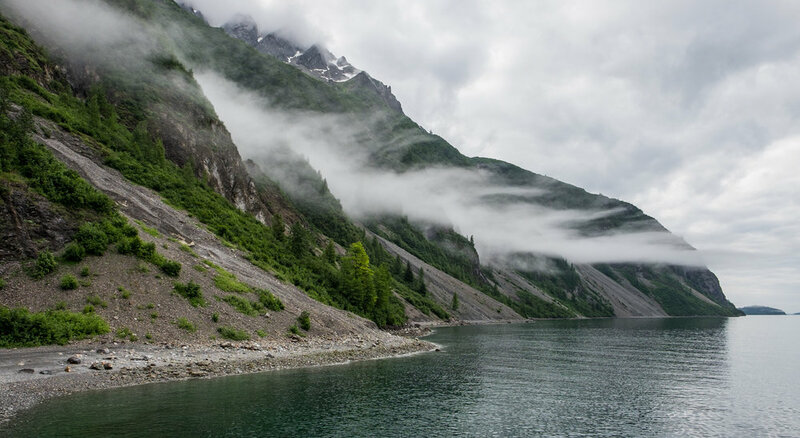 On average, 220 days of the year in Glacier Bay show some sign of precipitation – that is what folks in Seattle like to call a “marine layer.” Bring an umbrella if you want to, though rain layers on your person protect from that kind of weather a whole lot better. 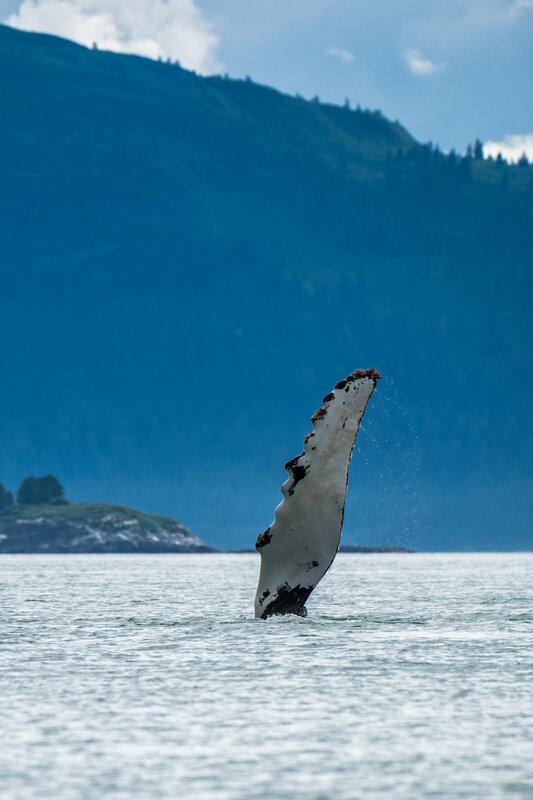 Humpback whales spend the summer in Glacier Bay and swim to Hawaii for the winter – where we will finish the Greatest American Road Trip this December…we'll get to see them twice! Moose, a recent newcomer to Glacier Bay, is part of the dear family. Don't fear bear, fear moose! More humans are killed in Alaska each year during a moose encounter than during a bear encounter. Porcupines live in the cottonwood trees that surround the bay. Don’t get tangled up with them, they can really harm humans! But do listen out for them… they make sweet, soft cooing noises. 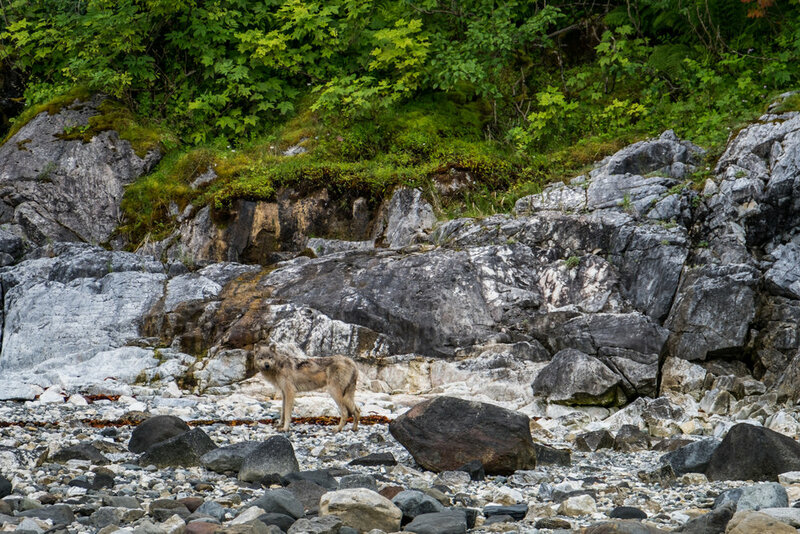 According to the NPS, mountain goats may have been among the first land animals to recolonize Glacier Bay after the ice retreated. A mama bear (sow) and her cubs unearth shellfish during low tide as seen from the National Park Service Tour Boat, an experience which can be booked at the Glacier Bay Lodge. 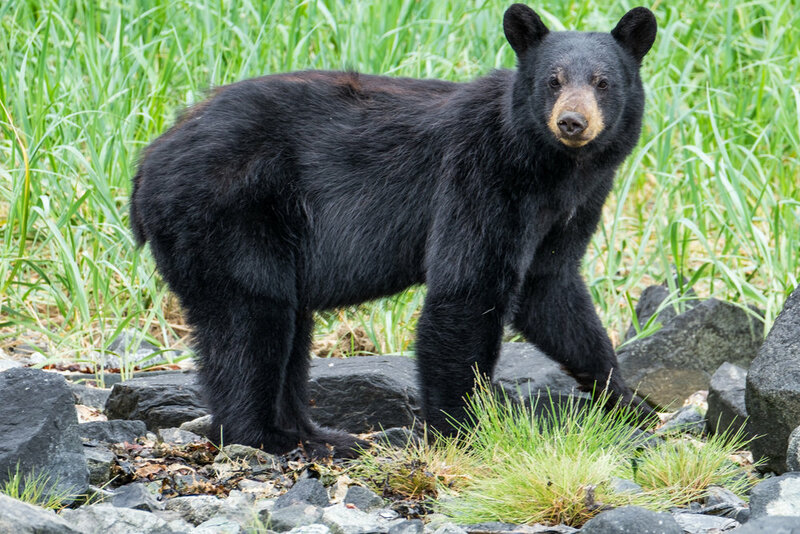 All of Alaska is bear country, and your presence in Alaska requires that you follow specific parameters to ensure their, and your, safety. Bear Resistant Food Containers (BRFR) or “bear cans” (as they are more commonly known) are a must to keep your scented items and food out of the mind and reach of brown and black bears. “A fed bear is a dead bear” they say—that is, when bears start to associate food with humans, they tend to get aggressive. Aggressive bears are most often put down in the name of public safety. We’ll get into the bear culture more heavily in some of our upcoming parks. Stay tuned! Alder is a plant that is abundant in Glacier Bay and in all of Alaska. Its dense makeup makes hiking through it quite difficult. To push through an alder thicket is no easy task, we assure you. 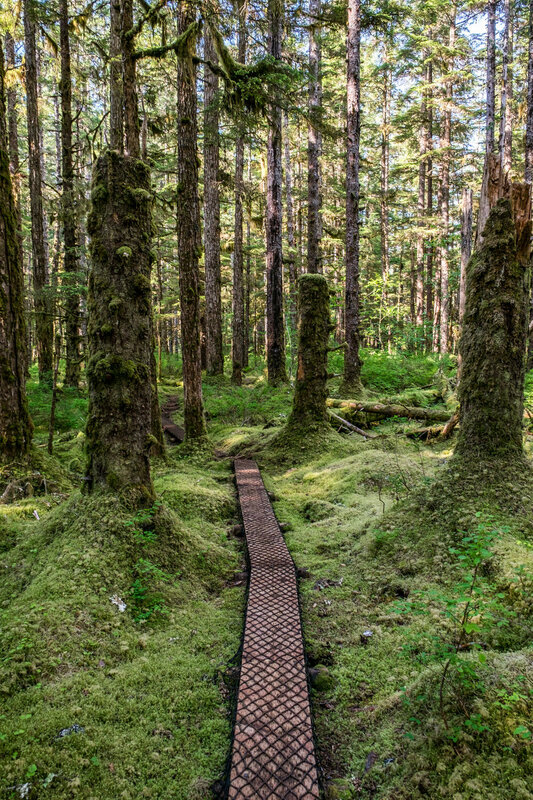 It is one of the great frustrations of hikers making way through Alaska backcountry. The berries it wields is part of the brown bear diet, so encounters are possible. The only developed area in Glacier Bay National Park is in Bartlett Cove, where you will find the Glacier Bay Lodge, Park Visitor Center, native American exhibits, easy hiking trails, a public dock from where you can push off on water-based adventures, sea kayak rentals, and a walk-in campground. Whitewater rafting is available on the glacial Alsek River and its main tributary, the Tatshenshini River. When the National Park Service established protection of Glacier Bay, native Huna Tlingit who called the area home for thousands of years suffered a great deal to the loss of land and control over it. Over time, tensions have ceased and the Hoonah Indian Association and the Park Service have begun to work together to (from the Park Service website) “reinvigorate traditional harvest activities that are compatible with current regulations, develop educational programs for Huna youth, sponsor summer culture camps, and collect and preserve oral histories.” You can see the new Tribal House just a short walk down the beach from the Glacier Bay Lodge. Scientists and glaciologists love Glacier Bay, not surprisingly. The retreat of glaciers makes this living scientific laboratory one that many want to uncover the secrets of. 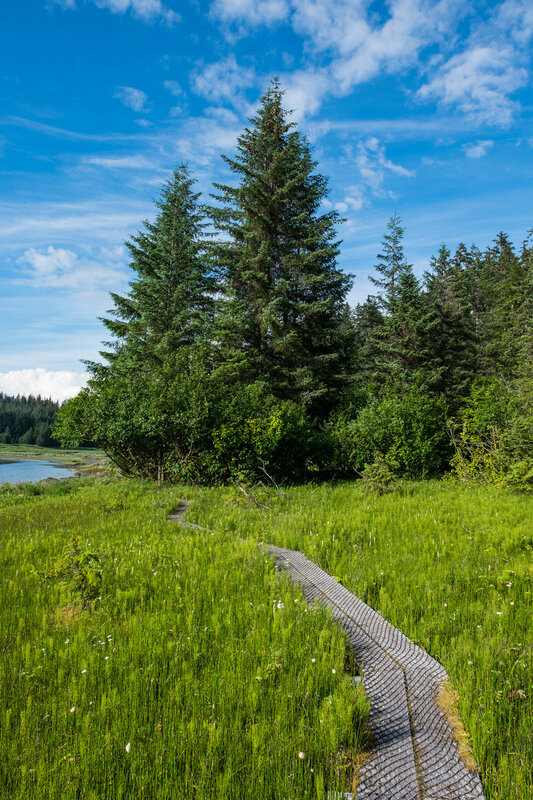 The beginning of scientific study in the area is a result of exploration there made by John Muir, the unofficial “Father of the National Parks,” who forged many examination studies there in the late 20th century. Research of glacial ice and its movement has since evolved to include bird species, rising seas, aquatic mammals, and plankton activity. Fancy yourself a mariner? 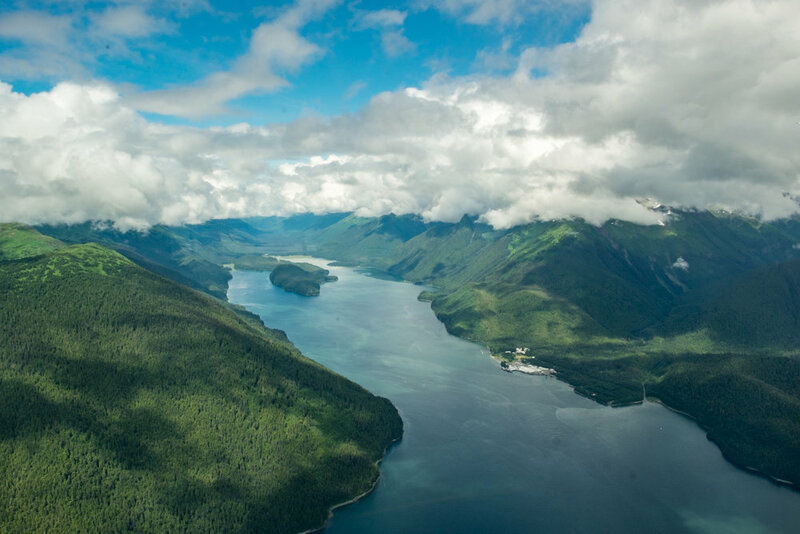 Learn about commercial fishing in the area in the Park Service writeup and downloadable "Navigating Troubled Waters; Part 1: A History of Commercial Fishing in Glacier Bay, Alaska by Jim Mackovjak. Glacier Bay is so rich, well researched, and well supported that we could never do it justice on this page alone at the rate in which we are traveling. Learn about related Park Service programs, timelines of glaciers, science, the health of the seas, tribal relationships, wilderness exploration, and many other topics in the Parks’ official 2016 Visitor Guide, The Fairweather. 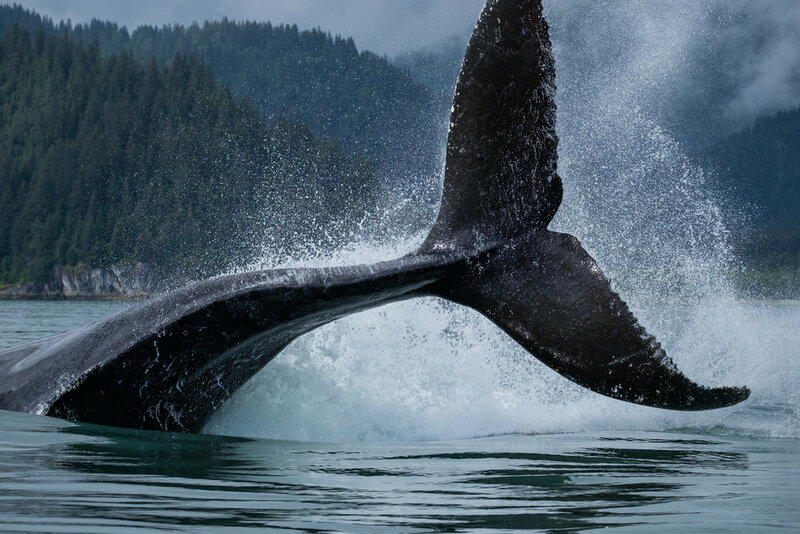 A humpback whale thrashes the waters of Glacier Bay, absolutely captivating every being on the planet within eyesight.